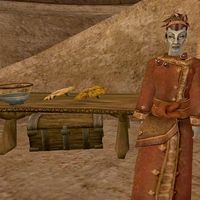 Fonas Retheran is a Dunmer trader who has set up shop in Ghostgate's Tower of Dusk. She will only do business with fellow members of House Redoran, of rank Oathman or higher. This page was last modified on 24 January 2014, at 03:54.